On the northwest Iberian peninsula, in Galicia, local communities manage more than 2,800 mountains. The Spanish coastline includes 230 cofradías: ancient, locally run governance systems that provide 83 percent of the country’s fishing employment and 95 percent of all Spanish ships. Iniciativa Communales estimates that roughly 60 percent of Spain falls under what international organizations call ICCAs: Indigenous Peoples and Community Conserved Territories and Areas. In Spain, these community-managed sites include forests, pastoral lands, Sociedades de Caza (hunting associations) and marine and coastal areas. ICCAs are defined by the International Union for Conservation of Nature (IUCN), an international organization composed of civil society groups and governments with observer and consultative status at the United Nations. Founded in 1948, it is the world’s largest and most diverse environmental network and receives counsel from about 16,000 experts. In 1961, it set up the World Wildlife Fund (WWF). Although “indigenous” may be a confusing term in the European context, community managed land areas have a rich history in Europe, despite the lack of recognition by national governments or the European Union. This lack of recognition is worldwide, regardless of the type of ICCA, and means that Indigenous and community managed areas of land or water are not fully included in national and international conversations about conservation. As a result, conservation efforts are falling far short of what they could achieve. Many areas of the world are insufficiently protected, community and Indigenous rights and livelihoods are at risk and opportunities to combat climate change may be lost. The reason for this gap is that there is a difference between a protected area and a conserved area. Therefore, IUCN distinguishes between ICCAs, protected areas and conserved areas. Conserved areas are sites that achieve conservation de facto, regardless of recognition and dedication, and even at times without regard to intentional management. Conserved areas are also considered likely to maintain such conservation over the long term. Conserved areas always include ICCAs but not always protected areas. In other words: just because a site is designated as a protected area does not mean it is conserved. Yet, nationally designated protected areas are the sites that are most frequently documented and make their way into national and international policy decision-making. In Canada, the Tla-o-qui-aht have established tribal parks throughout the country. These parks are another example of ICCAs that, although legitimately conserved areas, are not recognized by the Canadian provincial or federal governments. In these parks, the First Nation people’s interaction with the environment is based on the laws of nature and with the goal of ensuring sustainability for future generations. Their tribal parks are better known in Canada as Teechmis Okin. When viewed in the global context of other areas managed by Indigenous Peoples and communities, these parks can help to provide a better picture of what ICCAs can achieve around the world. According to IUCN, three to four hundred million hectares around the world are under community management, the majority of which achieve some degree of conservation. However, as in Spain, many ICCAs are not nationally or internationally recognized either because Indigenous Peoples or communities do not want this recognition (to avoid an influx of tourists, for example), or because national governments choose not to recognize them. Rather, “protected areas” receive international recognition and documentation, in many instances because international organizations defer to those areas that national governments have chosen to recognize. Such is the case with Protected Planet, which shares data from the World Database on Protected Areas, a project managed by UN Environment Programme and IUCN. IUCN defines a protected area as a “clearly defined geographical space, recognised, dedicated and managed, through legal or other effective means, to achieve the long-term conservation of nature with associated ecosystem services and cultural values.” In practice, this recognition requirement almost always means an area that has been recognized by a national government. This leaves many conserved areas, particularly ICCAs, vulnerable. As Grazia Borrini-Feyerabend of the ICCA Consortium explains, “Being an internationally recognized ICCA can provide more security. It provides an extra layer of protection against exploitation against national governments.” The ICCA Consortium is an international organization that supports and promotes recognition of ICCAs. They also help manage the ICCA Registry, an online database that tracks ICCAs around the world. Ms. Borrini-Feyerabend was the one to propose the simplified term “conserved areas” instead of OECM (other effective area-based conservation measures), a term that came out of the Convention on Biological Diversity to identify conservation targets for the current decade. She is leading an effort among conservationists and environmentalists to move away from the preoccupation with protected areas and focus instead on conserved areas. This shift would not only give ICCAs a much stronger political standing, but would also place the emphasis on the effectiveness of conservation. Currently, conservation debates center on those areas that have been dedicated to conservation regardless of whether or not conservation is successful on the ground. According to Ms. Borrini-Feyerabend, the effort to convince international stakeholders to favor the term “conserved areas” in lieu of protected areas has been a struggle. Canada in particular has been staunchly opposed to the idea, insisting on “science-based definitions” and citing a concern that the new phrasing would create a loophole for private Canadian companies to temporarily claim that an area is conserved only to later exploit the area. But as she says, “we cannot transport a Canadian definition to Cambodia.” Conservationists must find a definition that can meet global contexts, and in recent months, some Canadian representatives are starting to see that the “protected areas” terminology is hampering conservation efforts around the world. Recently, countries and organizations have been warming up to the shift to conserved areas. The UNFCCC is paying more attention to conserved areas, and there is a chance that a draft of the revised 2014 list of protected areas by the UN may include some reference to conserved areas. 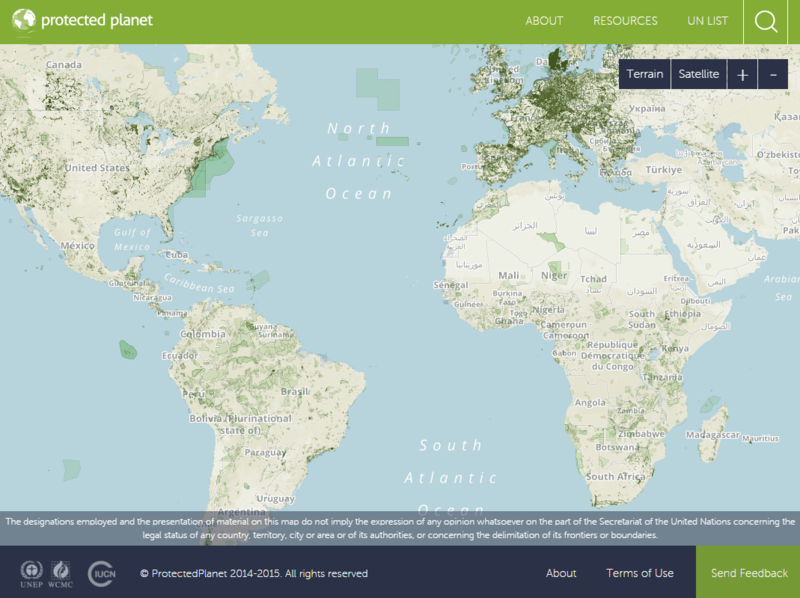 The current list, which is the basis for Protected Planet’s data, states: “Protected areas catalogued in the lists that are part of this report are protected areas officially designated by countries. The potential exclusion of conservation areas not yet recognised by national governments is in no way a judgment on the efficacy of these areas for conservation.” Thus, the current database does not necessarily include ICCAs or other conserved areas that are not yet recognized by national governments. A quick comparison of Protected Planet and the ICCA Registry reveals this gap through a lack of shared data. Moreover, registering ICCAs is a difficult task. The ICCA Registry, though it provides thorough data, contains very few ICCAs. The reason for this (other than the registry still being relatively new), as Ms. Borrini-Feyerabend explains, is that the ICCA Consortium works with regional and national networks to ensure that ICCA registry happens at the local level, rather than via a top-down approach. The ICCA Consortium believes that registry should be in the hands of the communities themselves and that each network should be able to devise their own framework for registration. These networks serve as peer review mechanisms, as they understand cultural contexts and are therefore best situated to determine which areas should count as ICCAs and what the process should be for registration. In Spain, for example, the local network has spent the past two years developing a process for registration. We should expect to see many new registered ICCAs in the coming year to reflect the roughly 60 percent of Spain that is estimated fall within the ICCA definition. Regional ICCA networks exist elsewhere around the world, including in Iran, Indonesia, Bolivia, Nepal, Kenya and other countries. In the Philippines, there is a major UN Development Programme effort to register ICCAs. While local efforts are important to secure ICCAs and other conserved areas, international recognition and progress will depend on IUCN and other UN agencies. IUCN’s “Governance of Protected Areas: from understanding to action” places special emphasis on the importance of ICCAs and particularly on Indigenous Peoples’ roles not in governance. It also values their rights via the United Nations Declaration on the Rights of Indigenous Peoples as well as biocultural rights that are tied to international and local conservation policies. This document will serve as the basis for IUCN to advise five to six countries in the coming months on how to improve their conservation through a more diverse and impactful approach to governance. Those countries have yet to be finalized, but the Philippines and Iran will likely make the list. 2016 stands to be an important year for international conservation. In the wake of COP21 in Paris last year, expectations for combatting climate change are high. The World Conservation Congress, which is held every four years, will take place in Hawaii in September, bringing together thousands of world leaders to coordinate on worldwide conservation efforts. Among the planned sessions are those that will tackle the question of moving from the protected areas terminology to a focus on de facto conservation as well as a session dedicated to assessing the various methods of governance and their effectiveness. Ultimately, in order for ICCAs to gain greater recognition, countries, NGOs and international organizations would have to embrace a more diverse set of governance systems and prioritize effective conservation.. According to IUCN, ICCAs far outnumber protected areas. While there is no official estimate of their percentage of the earth’s land area, we do know that protected areas account for 13 percent of the earth’s terrestrial surface, which means that ICCAs make up an even more substantial portion. Any serious effort to combat climate change would have to take these conserved areas into account. Likewise, policy making at all levels around the world could benefit from wider recognition of ICCAs.